I was in Montreal on a business trip and stayed with a dear colleague. He’s a bit of a gourmand so when he served me dulse with olive oil and toast for breakfast I was shocked. “We’re eating what for breakfast?” He promised I would become addicted, and addicted I am. We have it every morning, almost without fail. And the odd morning when we can’t have it, we miss it terribly. Andrew confessed one morning upon waking that he was actually excited about getting up so he could eat dulse. We’ve converted a number of people. Maybe we can convert you too? Cut up the dulse in the bottom of a bowl. Drizzle with good quality olive oil. Toast some nice multi-grain bread and cut it up on top. Eat. Become addicted. I will admit to being dubious 🙂 but will give it a go. Where are you buying the dulse in Toronto? You can get the Atlantic Mariculture dulse at the Big Carrot. Or, Andrew has started to order it directly in a large shipment (really!) straight from Grand Manan, NB, so if you want to buy it from us you can. Just let us know and we’ll make sure you get a package or two (or three….). Hi! 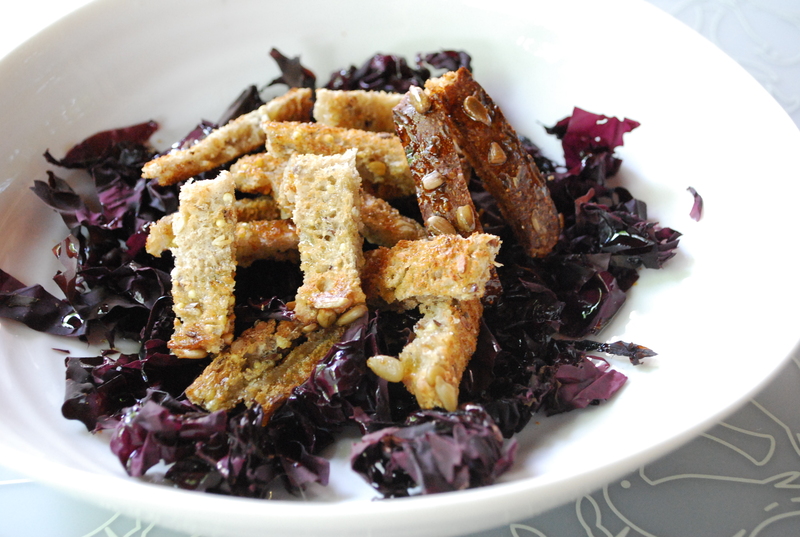 I have been eating a version of this yummy treat, but would love to use your dulse. Where do you get it? I introduced it to my mom the DAY YOU POSTED this at the FARM no less and I think we may have a new convert! So good. Jonathan and I ate so much of it with our new converts that we ended up dipping in to your olive oil stash. However – good news is we’ve found one that rivals Silver Leaf and will give it to you when you guys come for dinner. All hail the Dulse with Olive Oil and Toast Gods!!! (oh, and would love to get in on the seaweed cartel that Andrew is running)!!! Time for Emily’s mom to jump in. That was the best breakfast ever. So delicious and, despite indulging the rest of each day in fine wines and fat cheeses, I felt so fit by Monday morning i could hardly wait to get to the Y to burn off the energy. Breakfast must have had something to do with it. I’m a convert. Thank you Ruth. yes, i would love to have a source. Thank you Ruth. Well you converted us to the fantastic dulse breakfast a while back and now we’re hooked — good thing we know the dealers! Here’s a little additional zing if you want to have it for lunch…which I sometimes do since I make a rather larger bowl in the AM and leave it out for lunch. Today I just added a pile of crisp wasabi arugula leaves and some salsa verde and squashed it together with another slice. Presto – yummy power sandwich with just a bit of a kick. (If you can’t find the wasabi argula, just regualr old arugula with a thin spread of wasabi on one toast (minus the salsa verde) you’re all set. I was tempted to pair that with a lovely spicy Gewürztraminer, but I had to go back to work. More on the v:pairings later! Just reading this recipe again. I’ve evolved this into a lunch thing by replacing the toast part with a can of organic chick peas. It’s ridiculous how good this stuff is. I also use Zei Olive oil, which I think is hand’s down the best I’ve tried ever (from Thin Blue Line Cheese Boutique on Roncesvalles).